Perhaps you’re wondering what the chemical formula of sodium phosphate is. This is actually a difficult question to answer because sodium phosphate isn’t one chemical, rather sodium phosphate is an umbrella term for a number of different salts made out of both phosphate and sodium. There are different families of sodium phosphates including sodium monophosphate’s diphosphate and Polyphosphates. In general, though, sodium phosphates are made with sodium atoms, phosphorus atoms, and oxygen atoms. Naturally, sodium phosphates have sodium atoms within them and phosphates are made out of phosphorus and oxygen. Sodium phosphates typically appear as a white crystalline substance. Because sodium phosphate refers to multiple chemicals not just one, the melting points, boiling points, and density of sodium phosphate, as well as the other chemical properties of sodium phosphates, can vary widely between the different chemicals. Let’s examine some of the uses for sodium phosphates and take a look at some specific examples of sodium phosphates. Sodium phosphate is a possible food additive, used in the manufacturing of processed foods. Sodium phosphates can also be used in various medications and in a variety of household products. Sodium phosphate for use in foods is often used in the preparation of processed meats, deli meat, canned tuna, fast food, canned goods, and other types of manufactured food. Sodium phosphates are commonly used as an emulsifying agent, counteracting water and oil’s natural tendency to separate out – keeping water and oil mixed together. This is done to aid in the creation of certain kinds of process meats. Sodium phosphate is also used as a leavening agent, which speeds the rising of dough in prepared cake mixes and certain breads. Sodium phosphate is used to help cure meat and various meat products, keeping bacon and deli meats fresh for longer. Sodium phosphates also thicken food, and for this reason, they are used to stabilize processed foods like mashed potatoes. Sodium phosphates can also balance the pH levels of processed foods, which helps preserve them. Food grade sodium phosphate is considered “generally recognized as safe” by the FDA, meaning that sodium phosphate is generally safe as a food additive in low amounts. However, too much sodium phosphate can cause side effects like vomiting, headaches, abdominal pain, and irregular heartbeat. High levels of sodium phosphate could lead to elevated mortality rates in the general public, though only at high levels. Health researchers have recommended that if possible people should eat foods with natural levels of phosphates, rather than those with sodium phosphate added in. Sodium phosphate can also be used as medication. Oral sodium phosphate is often used to treat constipation, or to prep intestines for bowel procedures. Sodium phosphates are a laxative which functions by increasing the amount of fluid in the small intestines. The dosage of a sodium phosphate medication is based on the kind of procedure being done, the age of the patient, and the response to the treatment. Its dosages should be mixed in 8 ounces of water or 240 mL of water. Side effects of sodium phosphate used for medication can include nausea, gas, cramps, and dehydration. 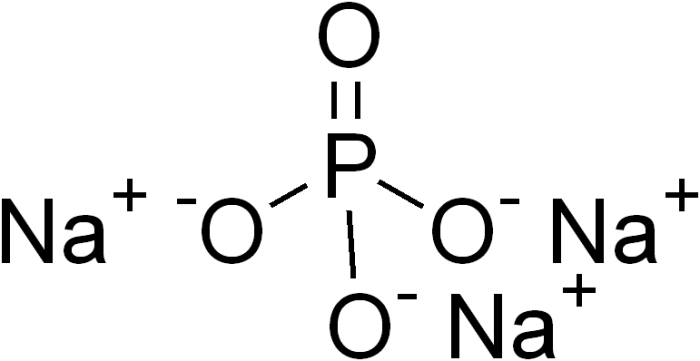 Monosodium phosphate is a common industrial chemical, created through the neutralization of phosphoric acid. The chemical formula for monosodium phosphate is 2 NaH2PO4. Monosodium phosphate is one of the primary chemicals used as an emulsifier and thickening agent, frequently added to evaporated milk, animal feed, and toothpaste. Monosodium phosphate also has a role in the detection of magnesium ion salts. Disodium phosphate has the chemical formula Na2HPO4. It is also referred to as sodium phosphate dibasic, or sodium hydrogen phosphate. 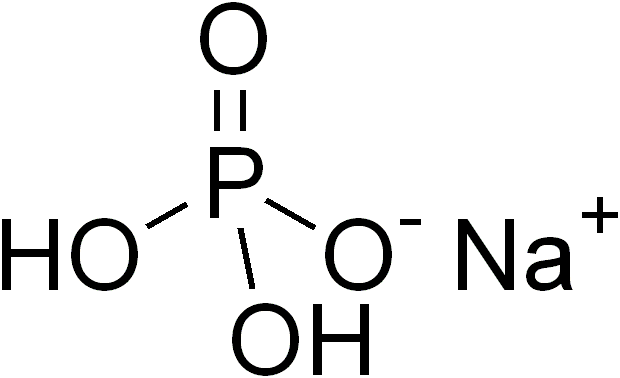 Disodium phosphate can come in several different forms, with varying amounts of hydrates. All of the different forms are water-soluble, however. Similar to monosodium phosphate, disodium phosphate can be created through the neutralization of phosphoric acid. As an industrial chemical, it is created by combining dicalcium phosphate and sodium bisulfate, which also has the side effect of precipitating out calcium sulfate. Monosodium phosphate (MSSP) is created through this process, and the MSP is partially neutralized to create disodium phosphate. Disodium phosphate is used to soften water, and adjust the pH of foods, frequently in conjunction with trisodium phosphate. The presence of disodium phosphate helps prevent certain processed foods from condensing, keeping them liquid, such as condensed milk. Disodium phosphate also speeds the cooking time of products like Jell-O instant pudding and Cream of Wheat, making these products thicken quicker. When used in the treatment of water, the sodium phosphate discourages the formation of calcium scale. The sodium phosphate is also used in some cleaning agents and detergent products, as it is capable of removing calcium buildup. Dibasic sodium phosphate and monobasic sodium phosphate are used as a laxative to clean the bowels prior to certain procedures, such as a colonoscopy, and is a saline laxative. Trisodium phosphate has the chemical formula Na3PO4. Trisodium phosphate is easily created through the use of sodium hydroxide to neutralize phosphoric acid. Sodium carbonate is also occasionally used. Though trisodium phosphate was once widely used in detergents and soaps, the use of trisodium phosphate in cleaning products has diminished since the 1960s, as research has shown that phosphate-based cleaners tend to cause eutrophication of rivers and lakes. Trisodium phosphate is occasionally used to dissolve copper oxides in copper medical grade plumbing. Some trisodium phosphates are still used in the production of degreasing and deglossing chemicals, used to prep walls for painting. Trisodium phosphate, along with bisodium phosphate, and monosodium phosphate are used as food additives. Trisodium phosphate is also occasionally used in the creation of nutritional supplements, and the claim for the use of trisodium phosphate is that phosphates are needed for the production of energy in the Krebs cycle. Because of the damage to rivers and lakes that sodium phosphate and other phosphates cause, various regulations are in place to limit their usage. Substitutes for trisodium phosphate are encouraged to be used in laundry detergents and water softening agents, and they are typically effective. Disodium pyrophosphate is created by heating up sodium dihydrogen phosphate. Disodium pyrophosphate is used as a chelating agent and a buffering agent. The grade of the disodium pyrophosphate affects how quickly it carries out its intended actions. Disodium pyrophosphate is often used alongside other potassium and sodium polysulfates in food processing. Specifically, disodium pyrophosphate is used to maintain the coloring and the taste of seafood when canning. When disodium pyrophosphate is used in cured meats, it makes sodium nitrate convert to nitrate more quickly, and it improves the water holding capacity of certain meats. Disodium pyrophosphate is also used to get stains out of hides during leather treatment, and it can also be used in certain dairy applications, like removing soapstone from dairy facilities. 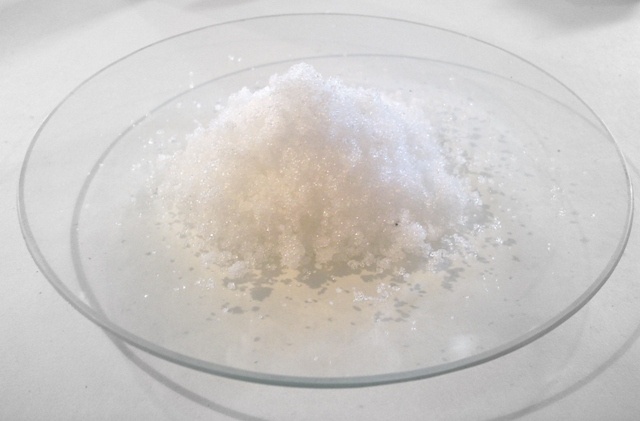 Tetrasodium pyrophosphate has the chemical formula Na4P2O7, and like other sodium phosphates it is used as an emulsifier, thickening agent, and is a food additive. Tetrasodium pyrophosphate is found in foods like canned tuna, crabmeat, marshmallows, chicken nuggets, pudding, cat food, and meat alternatives. Tetrasodium pyrophosphate is also sometimes used in dental floss and in toothpaste, which enhances the tartar control abilities of these products. Tetrasodium pyrophosphate can remove magnesium from saliva, which prevents it from building up on teeth. Many commercial dental products have tetrasodium pyrophosphate in it, as it helps reduce plaque accumulation. Tetrasodium pyrophosphate is also used in many household detergents to prevent the buildup of calcium deposits. As with other phosphates, the phosphate content of tetrasodium pyrophosphate leads to eutrophication of water, and its use is regulated. The eutrophication of rivers and streams caused by sodium phosphates makes algae to bloom out of control, and phosphorus can potentially generate 500 times its weight in algae. There are also sodium salts called triphosphates such as sodium triphosphate. Sodium triphosphate is also referred to as tripolyphosphates. It has a chemical formula Na5P3O10. Sodium triphosphate is used in many different industrial products, however, it is primarily used in detergents. The vast majority of sodium triphosphate is used in commercial detergents, where it is used as a water softener. Though sodium triphosphate is typically used in detergents, it is also used as a preservative for certain animal feeds, meats, poultry, and seafood. Polymeric sodium phosphates are created when mixtures of NaH2PO4 are heated up. This process produces a condensation reaction. Previous Post« Previous How Does Stress Impact Mood Disorders?